This DVD desiminates Multifunctional Intensive Land Use. 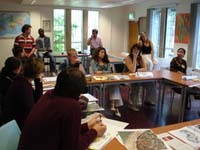 It is about the MILUnetwork of European urban planners. MILUnet is an INTERREG IIIC project of the European Union. The DVD is one of the first interactive cinematographic set of informative audiovisuals ever made for a special target group. The overall objective of MILUnet is to create an effective partnership network, aiming to promote Multifunctional Intensive Land Use as a means to achieve more sustainable (urban) development in the EU. The DVD contains seven short MILUnet films. Each film portraits a European town and has its own theme. They tell about a certain aspect of the MILUnet approach and the way the members of the network come to recommendations to solve quests in urban development. The scenes in the films are linked so it is an interactive cinematographic project. Klick here to get an impression. You can order this DVD at Habiforum.